The prevalence of diabetes for American Indian Elders across the United States is almost three times higher than the national average. American Indians and Alaska Natives (AI/AN) suffer from diabetes more than any ethnic group and the disease is increasingly affecting younger Indians, according to Indian Health Service (IHS) records. In some communities, the prevalence rate is as high as 60 percent among adults. For three decades, the IHS has served as a leader in the fight against the diabetes epidemic in AI/AN communities, earning national and international recognition for diabetes quality improvement. Major accomplishments include developing monitoring systems of diabetes clinical care, such as the annual IHS Diabetes Care and Outcomes Audit, and creating diabetes surveillance systems for tracking diabetes prevalence and complications. The IHS Division of Diabetes Treatment and Prevention (DDTP) has also developed and mobilized an extensive network to conduct diabetes treatment and prevention programs and activities throughout the Indian health system. Given the limited resources available for diabetes care, the IHS focuses on applying scientifically proven methods to prevent the onset of diabetes and costly diabetes-related complications such as cardiovascular, eye, nerve, and kidney disease. In the Balanced Budget Act of 1997, Congress established the Special Diabetes Program for Indians (SDPI) and provided $150 million over 5 years for “the prevention and treatment of diabetes in American Indians and Alaska Natives.” Funds have been reauthorized at $150 million per year through fiscal year 2013. The major components of the SDPI are administered by the IHS DDTP. There are 336 community-directed diabetes programs in 35 states that implement diabetes treatment and prevention programs based on scientifically proven Best Practices. These programs are designed to address local community priorities. Another 66 SDPI Demonstration Projects successfully completed a 6-year program translating the results of diabetes prevention and cardiovascular disease risk reduction research into diverse, real world Indian health settings. As a result of their work, we now know that it is possible to reduce risk factors for diabetes and cardiovascular disease in AI/AN communities. These programs are continuing their prevention efforts as well as working on toolkits to help disseminate their positive results, best practices, and lessons learned throughout Indian country. Diabetes health outcomes have improved significantly in AI/AN communities since the inception of the SDPI. One of the most important improvements is a 10.8 percent decrease in the mean blood sugar level (A1C) of AI/ANs with diagnosed diabetes (see chart), a major achievement over 16 years. Decreases of this magnitude translate to an almost 40 percent reduction in diabetes-related complications. Dr. Charles Grim, Director of the Indian Health Service, stated the agency statistics show that diabetes increased 128 percent among teens aged 15 to 19 between 1990 and 2004. On average, AI/AN are 2.2 times more likely to be diagnosed with diabetes than non-Hispanic whites of similar age. These risk factors include family history of diabetes, gestational diabetes, obesity, physical inactivity and poor eating habits. 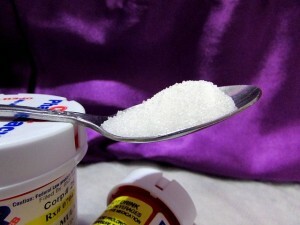 Diabetes is particularly common among middle-aged and older adults. According to IHS, the age adjusted diabetes mortality rate was 70 percent for AI/AN in 2004. Nationally, it was 20 percent for all races. According to US Census in 2000, about 52 percent of the AI/AN population is 55 and older. The unemployment rate (active workforce) is almost double the national average at 7.6 percent with 25.7 percent living below the poverty level. Most Tribal communities are rural communities where access to health care is limited and extreme poverty makes maintaining a vehicle difficult. Many families have one car for as many as four extended families. Jobs are often scarce and wages are 25 to 50 percent lower than the national average. Transportation and access to prevention programs is one of the major barriers to the community prevention efforts, but education on the issues related to diabetes and the fragmented community mobilization efforts also make for the incomplete intervention strategies among many Tribal communities. The National Indian Council on Aging is committed to assisting American Indian and Alaska Native Elders prevent or effectively manage diabetes through technical assistance, training, materials, and information. Please see the related web pages on our site for more help. Diabetes is a health problem that desperately calls for education and other prevention services. We know that lifestyle changes can prevent diabetes. It has been proven that if people eat right, lose weight, and become physically active, they can halt the progression to full blown diabetes. Diabetes is a group of diseases marked by high levels of blood glucose from defects in insulin production, insulin action, or both. Diabetes can lead to serious complications and premature death, but people with diabetes can take steps to control the disease and lower the risk of complications. Type 1 diabetes previously called insulin-dependent diabetes mellitus (IDDM) or juvenile-onset diabetes, results when the body’s immune system attacks and destroys its own insulin-producing beta cells in the pancreas. To survive, people with Type 1 diabetes must have insulin delivered by injection or a pump. This form of diabetes usually strikes children and young adults, although the disease onset can occur at any age. Type 2 diabetes previously called non-insulin-dependent diabetes mellitus (NIDDM) or adult-onset diabetes occurs when the body does not make enough insulin or cannot use the insulin it makes effectively. As the need for insulin rises, the pancreas gradually loses its ability to produce it. 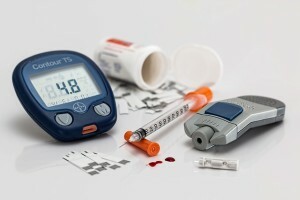 The following factors increase a person’s chances of having Type 2 diabetes: a family history of diabetes, being a member of an ethnic group such as American Indians or Alaska Natives, being overweight or obese, having had diabetes while pregnant (gestational diabetes), having high blood pressure, having abnormal cholesterol (lipid) levels, and not getting enough physical activity. Gestational diabetes is a form of glucose intolerance diagnosed in some women during pregnancy, and occurs more frequently among African Americans, Hispanic/Latino Americans, and American Indians. During pregnancy, gestational diabetes requires treatment to normalize maternal blood glucose levels to avoid complications in the infant. Women who have had gestational diabetes have a 20 to 50 percent chance of developing diabetes in the next 5 – 10 years. Diabetes can affect many parts of the body and can lead to serious complications such as blindness, kidney damage, and lower-limb amputations. Working together, people with diabetes, health care providers, and support groups can reduce the occurrence of these and other diabetes complications by controlling the levels of blood glucose, blood pressure, and blood lipids, and by receiving other preventive care in a timely manner. On average, American Indians and Alaska Natives are 2.2 times more likely to have diabetes as non-Hispanic whites. About 15.1 percent of American Indians and Alaska Natives aged twenty years and older are receiving care from the Indian Health Service have diabetes. Diabetes is least common among Alaska Natives (8.1 percent) and most common among American Indians in the southern U. S. and southern Arizona (26.7 percent and 27.6 percent respectively). Diabetes is a self-managed disease. People with diabetes must take responsibility for their day-to-day care. The chances of having diabetes complications can be reduced or delayed significantly by keeping blood glucose (blood sugar), blood pressure, and cholesterol levels in the target range. People with diabetes can manage their disease by eating healthy foods, being physically active, taking diabetes medicine as prescribed, and testing blood glucose levels. Community education and support programs can help people with diabetes and their families to manage their diabetes. Adapted from National Institute of Diabetes and Digestive and Kidney Diseases. U.S. Dept. of Health & Human Services, National Institute of Health, 2005.